The latest addition to the highly regarded and respected series of Veterinary Self-Assessment Colour Review books covers all aspects of cattle and sheep medicine. 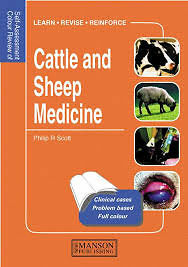 The 222 illustrated clinical cases are divided equally between cattle and sheep. The cases appear randomly to reflect real life practice and are presented as integrated questions, photographs and detailed explanatory answers meant to educate not just to test. This book will appeal to professionals in practice and in universities, as well as to veterinary students.